There are castles for rent in Ireland! Many travelers who dream of visiting Ireland love to imagine staying in a majestic castle and being surrounded by green fields, stone fences, and maybe even a moat. The image is a reality all across Ireland. You can stay in a castle hotel or rent your own castle while you are touring the country. You will find that luxury accommodations, medieval celebrations, real resident ghosts, horseback riding,wedding ceremonies and receptions are all waiting for you in a variety of castle settings in Ireland. The luxury castle hotels in Ireland include Dromoland in County Clare, located near Shannon Airport, and Ashford Castle in County Mayo, which is located within a two-hour drive from Shannon. These two hotels are at the top of the scale for comfort, prestige, and cost. Both five-star hotels are in the western part of Ireland and offer guests fine dining, beautiful rooms and high quality golf courses. Ballynahinch Castle in Connemara, County Galway, is a four-star hotel overlooking the river and the mountains. It is an ideal base to tour the West of Ireland. It was once the home of the O'Flaherty Chieftains, Pirate Queen Grace O'Malley and Maharajah Ranjitsinji (not all at the same time). The restaurant is elegant and serves delicious food. Ballygally Castle Hotel in County Antrim is a four-star hotel and restaurant beautifully situated along the Antrim Coast of Northern Ireland. The castle is said to have its own friendly ghost and dates back to 1625. The hotel is just 26 miles from Belfast, near Larne, and is a good base for visiting the Giant's Causeway and other northern destinations. Many castle hotels are less luxurious, and more affordable. 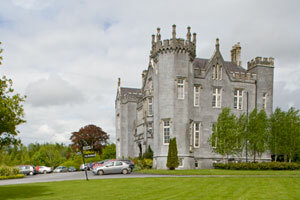 Kinnitty Castle in County Offaly, is a popular venue for weddings and vacation travel. 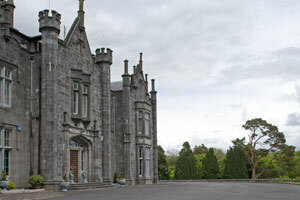 Belleek Castle , in County Mayo, is another moderately-priced castle hotel. Located at the end of a beautiful tree-lined drive, the 15th century castle offers stately guestrooms. Belleek Castle is on 1,000 wooded acres where you can walk for miles before dinner. Guests can view the castle museum by appointment and see ancient relics on display. 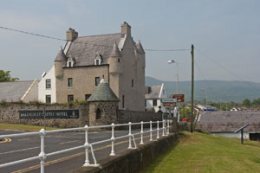 Ballyseede Castle Hotel in Tralee, County Kerry, offers twenty-two rooms and a break from modern life The rooms have been refurbished for your comfort. Individual rooms are available. Renting an entire castle can even be affordable. Some small castles for rent in Ireland have three bedrooms and can be rented for under $2,000 per week. Ballyportry Castle , Corofin, County Clare is an authentic Gaelic tower house that sleeps up to eight people in six bedrooms. Ballyhannon Castle (are these names starting to sound the same?) is a small self-catering property near Limerick City. It sleeps up to eight people in four bedrooms and offers the experience of an authentic 15th century Irish castle. The five-bedroom State Room Apartment at Knappogue Castle in County Clare, can be rented for under $7,000 per week. Knappogue is close to Shannon Airport and offers public medieval banquets, storytelling and music during the tourist season. Knappogue Castle is managed by Shannon Heritage. Lismore Castle , County Waterford, is the Irish home of the Dukes of Devonshire. It is a spectacular castle with a stunning view of the Blackwater Valley to the mountains beyond. Although the castle is private, groups of up to twenty-three guests may rent the quarters when available. The Duke's personal staff will attend to your needs. Wedding parties of up to seventy-five guests may be served in the banquet hall if you are lucky enough to arrange a wedding in Lismore Castle. If you like adventure, you can stay in a haunted castle. Castle Leslie in County Monaghan, has been "visited" by deceased Leslie clan members according to many witnesses. The ghosts must be friendly. Adams & Butler is a rental company in Dublin that helps visitors locate castles for rent in Ireland. 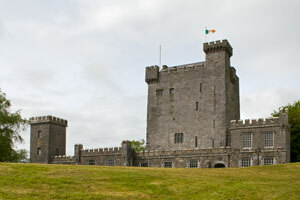 They assure us that a variety of castles at a variety of costs are available in a variety of locations in Ireland. You may like a castle by the sea, a castle in the mountains, or a castle near a city. If you stay in an Irish castle during your visit, you will have an experience not many others have had. You will imagine how it must have been for those in centuries gone by. Wherever you find castles for rent in Ireland, you will experience the beauty of the countryside and the beauty of the Irish people.